Recently opened on a new location, the restaurant is surrounded with a large garden and decorated with simple furniture, flower arrangement and plants. Sweetcorn with ant mayonnaise, coffee and costeño chili, served on burning leaves. Both images courtesy of Pujol. Let’s face it. Watching a Chef’s Table documentary of a restaurant makes you curious to visit. 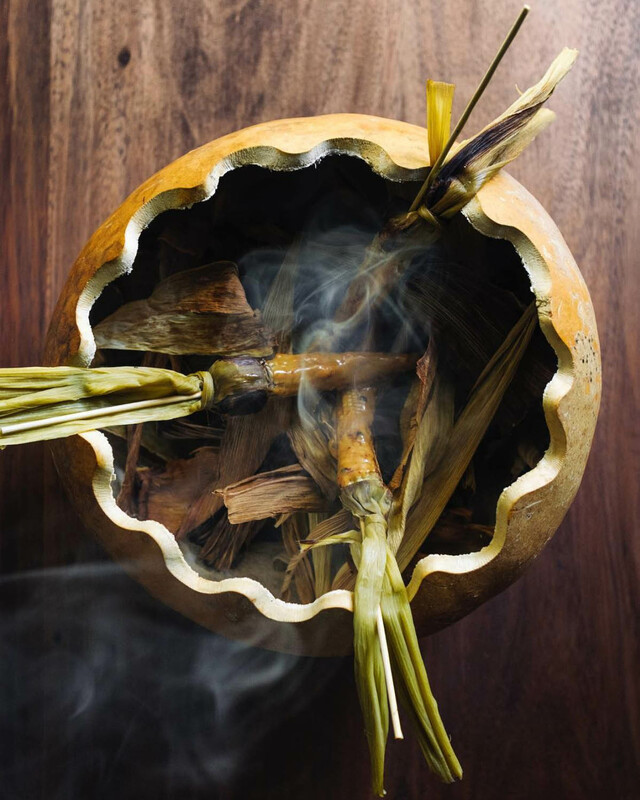 The minute we had booked our stay in Mexico City, we made reservations at Enrique Olvera’s restaurant Pujol. Olvera has a restaurant in New York as well. We ate in Cosme last year, before knowing whose place it was, and while the ambience was not intimate and original enough to make it one of my favorites in the city, everything we ate was simply delicious. 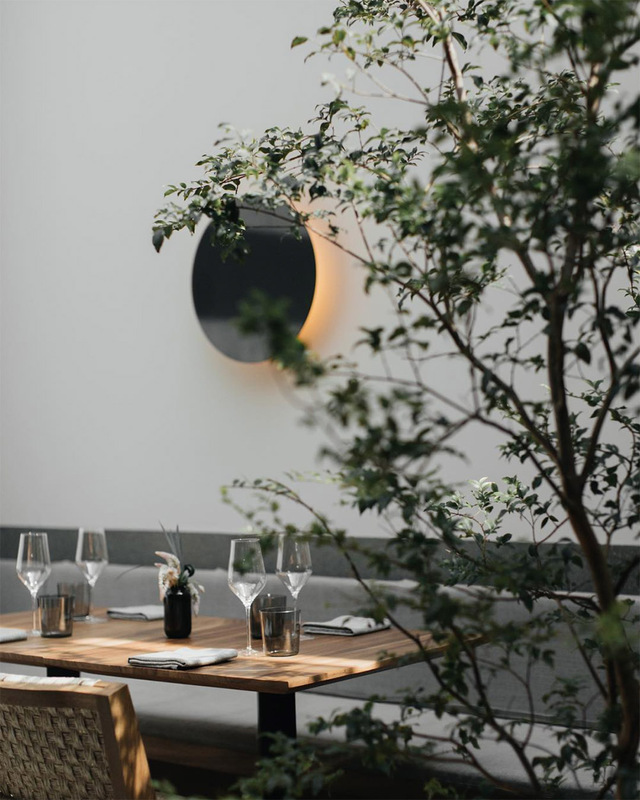 The latter is true with Pujol, too, and what’s more, here, in the recently opened new space located in Polanco, the details of the interior and lighting were just right for an elegant yet effortless and intimate dining experience. Beautiful wood surfaces, huge flower arrangements, terrific lighting. And everything we ate, we liked. It was not groundbreaking, it was good food, things that I could eat any day, every day. What I remember the most vividly though, were the virtually weightless champagne glasses – such a lovely lightness seen next to traditional pottery from Oaxada – the taste of mint mole that came with lamb chops, and a corn appetizer that was served on burning leaves. At one point of the evening, we got invited into the kitchen, which made the whole visit even more memorable. Yes, the kitchen in places like these is aesthetically picture perfect and works like a well-oiled machine. But what you sense in Pujol is also, simply, good vibes. I am so happy about the success this restaurant has brought Olvera and his team. Menu changes all the time but I get the sense that a good part of the dishes remain the same for a longer while. On October 18, it was six courses out of which two were fixed. Everyone began with street snacks and had mole after main course. For the remaining four dishes you had four different options to choose from. Mole is a traditional Mexican sauce that is usually made with fruit, chili, nuts, spices, even chocolate. Olvera’s signature dish combines aged mole madre (in our case it was 1412 days old) served with mole nuevo that is lighter and less complex in taste. However, the term mole is generally used for a number of sauces that may be really complex and smoky, or really fresh and simple, such as the fresh mint mole we had in Pujol, or guacamole, which we are all familiar with. Guacamole is a mole (sauce) made with aguacate (avocado). My favorite Mexican eating is ordering something simple, like grilled fish or seafood, and make tacos out of it. And although Pujol can be considered to be a fancy restaurant, this is how you eat there too. Elevated street food in a beautiful setting and our waitress asking if we would like a couple of more tortillas to finish off our sea bass.